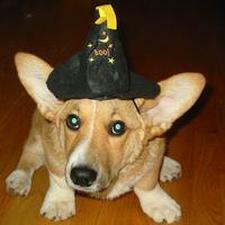 KC/FCI: Preferably dark, to blend with coat. One or both eyes pale blue, blue or blue flecked, permissible only in blue merles. AKC: Clear and dark in harmony with coat color. 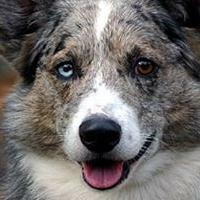 Blue eyes (including partially blue eyes), or one dark and one blue eye permissible in blue merles, and in any other coat color than blue merle are a disqualification. KC/FCI: brown, blending with colour of coat. AKC: Variations of brown in harmony with coat color.While dark eyes enhance the expression, true black eyes are most undesirable, as are yellow or bluish eyes. 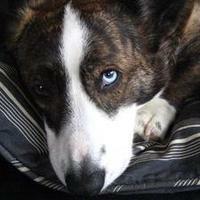 It occasionally happens that a tricolor, red, sable or brindle Cardigan has one, very rarely two blue eyes. 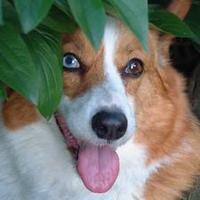 These so-called “wall eyes” do not automatically indicate that the dog carries the merle gene. There is a type of blue eye that follows a different pattern of inheritance. 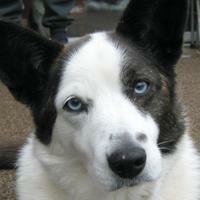 It is genetically the same sort of blue eye found, e.g. in the Siberian Husky. 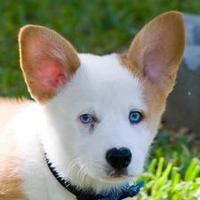 This type of blue eye is also seen in the Pembroke Welsh Corgi, albeit equally rarely. “Research shows that this sort of blue eye occurs in the approximate proportion of one out of sixteen from parents that carry the recessive genes for this blue eye. Those two genes are inherited in an entirely different manner, the merle gene being an autosomal dominant and the blue eye being a polygenic recessive. This blue eye does not appear as frequently as one could expect of the usual recessive quality because it depends on a polygenic mode of inheritance; that is, a blue eye does not appear unless there are more than one pair of recessive genes in a homozygous or pure state. The diagram shows the recominbations possible of two pairs of genes in the mating of individuals that are heterozygous for both genes. The genes are labelled Aa and Bb. The capital letters represent the dominant gene for dark eyes and the lower-case letter is the recessive for the blue eye. 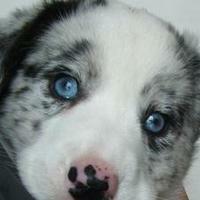 The puppy must have four genes for the recessive quality in order to have a blue eye. 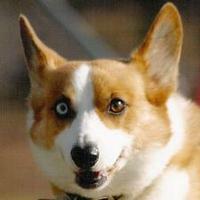 The number of genes necessary for a blue eye to occur is theoretical at this point of research. We know that it takes at least two pairs. A and B – the presence of either of these genes assures brown eyes. a and b – four of these genes are necessary to produce a blue eye. Notice that out of the sixteen there is only one that is homozygous (pure) for the dominant quality (AABB), thus cannot produce or pass on genes for anything but brown-eyed offspring and only one that is homozygous (pure) for the recessive quality (aabb), thus expresses the blue eye. The possibility of this particular pair coming up with that one-out-of-sixteen puppy is there, but rather slim. The diagram also shows all the other possible combinations of these two pairs of genes. We can see the reasons why one cannot declare an individual free of the recessives by breeding results in just one generation as is possible for a simple recessive. For example, any dog with the pairing of either dominant such as AAbb or aaBB will be incapable of producing a blue-eyed puppy, yet they are passing along recessives for the quality – recessives that may be just the key to bring out the blue eye in the next generation. In the mating of AAbb to aaBB the offspring would all be the same, AaBb. These, of course, take us right back to the examples in the diagram. All this adds up to the fact that this unwanted blue eye is genetically well-established in the breed; even a line that never produces the blue eye can still be carrying the genes for this quality; that it can and does reappear in the most unexpected places. Why do blue eyes reflect red? 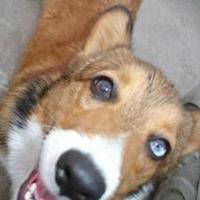 The pupils of dogs with brown eyes reflect either green or yellowish when photographed with flashlight whereas dogs with blue eyes reflect red. Dogs (and cats) have an iridescent layer behind the retina, the so-called tapetum lucidum, which gives a shining appearance to the eyes when illuminated in the dark. This layer acts like a mirror and reflects light back through the retina thus improving vision in low-light conditions. The red reflection is caused by the lack of pigmentation or lack of tapetum lucidum whereby the underlying choroidea shines through just like in the eyes of humans who don’t have a tapetum lucidum. The colour of the iris itself is of virtually no importance for the red-eye effect. The cells of the tapetum are modified melanocytes but do not produce pigment (in contrast to genuine melanocytes). 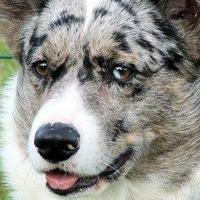 Some genes responsible for the general pigmentation, such as the merle gene (M) and the extreme-white piebald gene, also adversely affect the development of the tapetum, its structure and/or function. In certain cases the tapetum lucidum may even be absent altogether. 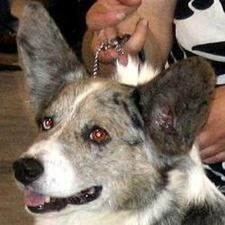 So far, there is no clinical evidence that the lack of tapetum impairs the dog’s vision at night. 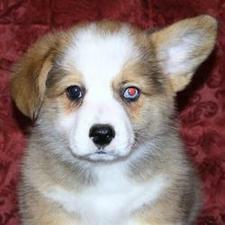 In blue merles even the brown eyes reflect red, whereas in Corgis who do not carry the merle gene only the blue eye reflects red as is beautifully illustrated by the photo of the Pembroke puppy with one brown and one blue eye. 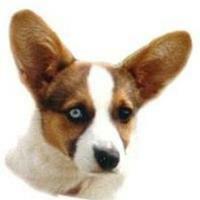 I wish to thank all those who have sent me photos of their dogs with blue-eye dogs. Special thanks go to ophtalmologist Dr.med.vet. Marianne Richter, Dipl.ECVO, http://www.eyevet.ch, for assistance regarding the “red” eye effect. Titres: What Do They Mean? The subject of titres (sorry I spell it that way but I’m Canadian, eh) was mentioned in a previous post and I thought it might be a good idea to outline here what titres are and are not capable of. Many vets and pet owners are fond of using titres to determine whether a dog requires re-vaccination with the understanding that a low titre equals low immunity. Wouldn’t it be nice if that were true, but unfortunately it is not. The ability of titres to accurately measure immunity is limited because it measures only a portion of the body’s immune function. Viruses can not replicate on their own and must invade our bodies and hijack our cells and cellular machinery to replicate. This means that once a virus invades our body, it is in our own cells. The defense system against these viruses is twofold and can be divided into cellular immunity and humoral immunity. As the name implies, cellular immunity works on a cellular level where T cells are able to detect which of our cells contain the unwanted virus and work to destroy it. When our T cells are activated against a virus, they file the information away for future use and this allows them to respond much quicker the next time the body is faced with the virus. These cells are always reproducing and they pass this memory on to their ‘children’ and this memory exists for life. This explains how we are immune to many viruses after getting them once. The T cells protect cells like soldiers protect a fortress. Humoral immunity is like the front line troops that work outside the cellular fortress: it is the first line of defense. Humoral immunity occurs in the body fluids where B cells float around on sentry duty. When B cells come into contact with antigens (proteins from a virus), they activate antibodies which they carry on their back. These antibodies identify and neutralize foreign proteins. Each antibody is responsible for a different antigen, so some might be responsible for distemper, some for parvovirus, etc. After an antibody is successful at neutralizing any nasty antigens, it will float around the body for years, working as a sentry. Like T cells, B cells develop a memory which allows them to respond quicker and with more force the next time they come across the same virus. A titre is capable of measuring only a small part of the active immune system: circulating antibodies. If a titre is high, it is a good assumption that the immune system is perfectly capable of a successful response to the antigen in question. So if your dog has a high titre for parvo, it is extremely unlikely that he will suffer the disease, even if he is exposed to parvovirus. If there are parovovirus antibodies circulating in his system, then the B cell front line troops and the T cells that protect the cell fortresses are armed and ready to go. What if the circulating antibodies are low? Does that mean that immunity is low? Well, the answer is no. Immunity is an all or nothing thing: a dog is either immune or he is not. There is no grey area or sliding scale. If a titre is low and you have a reasonable expectation that your dog has been exposed to parvovirus for example (either through exposure or vaccination), then a low titre really has no predictive value. Memory cells which are produced by T and B cells exist for the life of the animal: circulating antibodies may or may not. Just because circulating antibodies are low (and therefore the titre is low), does not mean that your dog can not fight infection if exposed to parvovirus (or any other virus). There may not be circulating antibodies present, but the memory cells are there and waiting to launch a quick and powerful attack on parvovirus antigens, activating the antibodies and neutralizing any threat. The fortress protecting your dog’s cells is still very well protected by front line troops and T cell soldiers and remains so for the life of the dog. Based on this, what is the predictive value of a titre? Well, a high titre has a very good predictive value. If a titre is high, then your dog is either suffering from the disease or has successfully fought it in the past and can expected to do so in the future without further vaccination. If a titre is low, then it is of little value as it comes down to guesswork. A low titre does not mean low immunity. It is for this reason that I think titres are not a good use of money. The exception would be using titres to determine the effectiveness of a vaccination (not that I necessarily endorse vaccination). If you were to vaccinate a puppy and run a titre about three weeks afterward, it would have wonderful predictive value. If you were to vaccinate for distemper and parvo at 12 weeks, then run a titre at 15 weeks for example, now the titre would be of value. 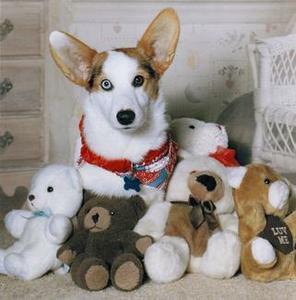 If the titre is high, then there are circulating antibodies against the parvo or distemper virus. If this is the case, then it is extremely likely that memory cells will have been produced by B cells and T cells and your puppy is protected for life. There is no need for further titres and certainly no need for further vaccination. In my opinion (for what it’s worth), this would be the best use of a titre test as a low titre would now have predictive value, meaning there was either vaccine failure or passive immunity (maternal antibodies) blocked the vaccine (which is possible for up to 26 weeks of age with parvovirus). I wish more vets, breeders and puppy owners would use titres in this manner, instead of hapharzardly vaccinating at three or four week intervals, trying to catch the period in time when passive immunity is low enough for the vaccine to work. It would take a lot of the guesswork out of a vaccine schedule and eliminate the need for unnecessary vaccinations. I have to admit that the amount of training I do with my dogs is at times embarrassingly small! Last winter I raised three puppies all the same age and by the time they were a year old, they still didn’t know how to down or even shake a paw!! Not exactly impressive for somebody who teaches dog training classes for a living! Despite their lack of formal education however, they did not jump up on visitors, they never pulled on leash, they never bolted through doors and they always came when they were called. My time investment to get these important behaviors was pretty much zero and I owe it all to the Premack Principle. The Premack Principle states the following: a high probability behavior will reinforce a low probability behavior. Did your mother told you to eat your vegetables before you had dessert? If she did, she might have taken psychology 101 in school as she was putting Premack into action. eating vegetables for kids is a low probability behavior: it is not very high on their list of things they want to do. Eating desserts and sweets for most kids is a very high probability behavior: it is something they are very motivated to want to do. By rewarding vegetable eating with dessert eating, mothers make vegetable eating much more likely to happen. The high probability dessert eating reinforces vegetable eating. What has this got to do with my dog pulling on leash? In order to get your dog to give you behaviors you want instead of engaging in the behaviors that he wants, you only need to know the relative value of each behavior. For example, ball chasing for most dogs is much more reinforcing than dropping it at your feet or in your hand. Your dog learns over time however, that there is a relationship between the two: he must bring the ball to you before you throw the ball for him. Your dog quickly learns to exchange a low probability behavior (dropping the ball) for a high probability behavior (chasing the ball). Ball chasing reinforces the behavior of ball dropping and your dog will be much more likely to drop the ball in order to earn your throw. In the case of my puppies, I only needed to know the relative values of the behaviors I wanted them to engage in and the behaviors they wanted to engage in and I could quickly train them without formal training sessions, cookies or coercion. To teach my puppies to wait at the door, I simply made going through the door (a high probability behavior) contingent on sitting and waiting (a low probability behavior). That meant I would put my hand on the door knob and wait and smile. Once my puppies offered me what I wanted (sit), I gave them what they wanted (I would open the door). Sitting and waiting was reinforced by going through the door. It can be a mistake to not take stock of what behaviors are highly reinforcing for your dog. You will have a much better chance of getting your dog to do what you want if it earns him access to what he wants. Obedience should not be viewed by your dog as something that takes reinforcement opportunities away from him: it should be something that he can exchange to gain access to what he really wants. Once this exchange program is in place, a very cool thing happens. Those low probability behaviors like sit and walking on a loose leash, actually become high probability behaviors because they are associated with very powerful reinforcers that your dog really values. Like your mother, you now know a thing or two about the Premack Principle. Now go eat your vegetables! A call for improving our etiquette with older dogs. Like everyone else in a society loudly lamenting a decline in civility, I recognize there are new breaches of etiquette every minute. On any typical day, cell phones alone account for the rudeness factor going off the charts. But I believe there is one type of impolite behavior among adult humans that goes pretty much unchecked. I’ve been guilty of it myself and slinked away feeling really stupid. It just isn’t something that makes it into the etiquette books and it apparently isn’t even worth Miss Manners’ fleeting consideration. I am referring to the blunt, utterly uncensored and often just plain mean things people say to us about our dogs (by “us” I mean dog people). My close friend Pam has a 12-yearold German Shepherd who is visibly aging. So are the rest of us, human and canine, but to what person would you ever be so crude as to say the following: “Is that your mother? Wow, she looks awful. She can hardly move!” Yet this is the unsolicited blubbering my friend endures from strangers, all day long, about her old dog. I empathize because I’ve been through this three times, beginning with our family Beagle, Sam, who lived to be nearly 17, mostly out of spite. “How old is he?” People would ask this unrelentingly about my now-departed Irish Setter, Amos. I didn’t mind telling them that he was 12 or 13. “Wow. They don’t live much longer than that, do they?” How tacky is this? But it gets worse. When my big, hairy mutt, Louie (we called him our “Bavarian crotch-smeller”) was old and frail, someone once asked me, “Have you thought about putting him down?” First of all, that’s kind of like asking a woman in her 40s (this also happened to me), “Have you ever thought about having children?” “Gee, there’s an idea! Why didn’t I think of that?” When your dog is old and sick, the end is pretty much all you can think about. Your heart is breaking and you’re preparing yourself to come to that decision in a way that spares your dog unnecessary suffering while giving yourself time to feel as peaceful as possible about letting him go. Pam is at the point where she dreads walking her dog in public because she knows passersby will make insensitive comments she can’t bear to hear. Out in the world she is thoughtful and tender enough not to remind everyone she encounters that they are mortal. Like the rest of us, she can tell when a person’s on his or her last legs, but she keeps herself from saying, “Gee, you sure are slowing down” or asking the person’s daughter, “So how long do people in your family tend to live?” When approaching people like my friend, it helps to remind oneself that she knows her dog is old. She knows it every waking second of every day. The last years and months we share with our geriatric dogs are among the most bittersweet times in dog lovers’ lives. We know, from the moment we choose these guys as puppies or meet their limpid stares at the animal shelter, that our hearts will be torn apart some day. What makes it so much worse is that the older they get, the sweeter they get, and when they reach absolute critical sweetness—you simply cannot love them any more than you already do—they grow completely exhausted and die. So a person patiently coaxing an old dog on his increasingly shrinking route is someone who could benefit from a little compassionate restraint. Like a simple hello for the owner, or a tender pat on the head for the doggie emeritus. Gust Brown, Brown strategist Steve Glazer and a fair share of the Sacramento press corps analyzed the news in great detail with Sutter, who rolled on the lawn and sniffed well-wishers. At about the same time, the governor’s press office announced via e-mail a statewide hiring freeze, which went unremarked on during Sutter’s event. Glazer has been tweeting about Sutter for weeks, and someone (presumably not the dog himself) has been tweeting under the handle SutterBrown since early-January. Sutter had belonged to Kathleen Brown, who relocated to Chicago to take a different position with investment firm Goldman Sachs. Gust Brown said she and the governor settled the first dog issue on Valentine’s Day. It marks the first time since at least before Brown’s first two terms, from 1975-1983, that a governor has announced a first pet of any kind. Bordatella or Kennel Cough is commonly required by boarding kennels and veterinary hospitals. These vaccinations are delivered to a staggeringly large percentage of dogs and the reason is not to protect your dog: the reason is to protect these facilities against liability. What is interesting is that when you bring your dog to the vet for his Bordatella vaccination, he will have already been exposed to the natural flora: all animals are exposed to both Bordatella and Parainfluenza prior to vaccination. It makes little sense to vaccinate an animal for something he has already been exposed to. There are at least forty agents capable of initiating Bordatella so vaccination might appear to be prudent if it weren’t for the fact that only two of these agents are contained in the intranasal vaccine. This poor percentage truly makes the Bordatella vaccine a shot in the dark. The lack of efficacy is well summarized by noted immunologist Dr. Ronald Schultz: “Kennel Cough is not a vaccinatable disease”. First, there is a real danger of dangerous immunological overload when vaccinations are offered in combination. Second, like Bordatella, most dogs have already been exposed to Parainfluenza, making the necessity of vaccination questionable. Third, the Parainfluenza vaccine is just as ineffective as the Bordatella vaccine because the vaccine does not provide antibody against Parainfluenza where it is most needed: on the mucosal surfaces. Other dangers associated with the Bordatella vaccine are obviously not far removed from the dangers associated with any other vaccination. Although Bordatella is a bacterial vaccine, we now know that bacterial vaccines present the same threat as Modified Live Vaccines. Modified Live Viruses from human vaccines are now known to become incorporated in the genes of the host and can shuffle, reassert, and reactivate thirty or more years after vaccination. Bacterial genes are capable of the same activity, lurking in the genetic makeup, waiting to replicate and awaken. The intranasal Bordatella vaccine has been known to activate a previously asymptomatic collapsing trachea and disrupt phagocytic activity which can progress to pneumonia. The toxins from the vaccine will also kill the ciliated lining of the trachea, creating a denuded area susceptible to anything coming down the windpipe. Perhaps collapsing trachea, irritable tracheas and pneumonias are all complications of Bordatella and the Bordatella vaccine. Vaccination of any sort also elevates histamine which can promote cancer, chronic inflammation and loss of tolerance. In general, all vaccination creates immune dysregulation and is responsible for a vast array of pathology. The Bordatella vaccine can wreak havoc outside the body as well. Bordatella will shed from a vaccinated host for seven weeks while Parainfluenza will shed for a week. This means that every vaccinated dog is a walking dispenser of potentially damaging bacteria. While the risk to other dogs is obvious, it should be of little concern to healthy dogs because Bordatella is generally a self limiting disease. What you might find surprising is that the shed bacteria is a risk to other animals…and to people. The reason we now have a feline Bordatella (and not surprisingly, a feline Bordatella vaccine), is likely thanks to the widespread use and subsequent shedding of Bordatella from vaccinated dogs to cats sharing the household. If this seems hard to imagine, consider how dogs first fell victim to Canine Influenza. Canine Influenza was initially documented in racing greyhounds. It is worth noting that many of these dogs shared tracks with race horses: race horses who are routinely vaccinated with Equine Influenza. It is not a stretch to predict Bordatella will infect gerbils, hamsters and rabbits in the near future and it is with certainty that the vaccine manufacturers will be well rewarded with the continued fruits of their canine Bordatella vaccine. Not surprisingly, humans are not left out of the equation. Ruth Berkelman MD (Former Assistant Surgeon General, US Public Health Service) writes: “The potential for both exposure and for adverse consequences secondary to exposure to veterinary vaccines in humans is growing. Enhanced efforts are needed to recognize and to prevent human illness associated with the use of veterinary vaccines”. Dr. Berkelman noted that pertussis an whooping cough-like complaints in children followed exposure to Bordatella bronchiseptica from the Bordatella vaccine and it is no coincidence that Bordatella bronchiseptica and whooping cough pertussis are very closely related. Interestingly, the rate of whooping cough is highest in highly vaccinated populations. Immunocompromised humans and animals are at an elevated risk of infection from these canine vaccines. There is a recently reported case of Bordatella bronchiseptica pneumonia in a kidney and pancreas transplant patient who had to board and subsequently vaccinate her dogs at a veterinary clinic while she was hospitalized. Vaccines contain contaminating agents including mycoplasmas which are also very communicable to humans and other mammals. In the end, vaccination for Bordatella is at best fruitless and at worst, a pathetic fraudulence at the hands of veterinarians and vaccine manufacturers. It is up to you whether or not your dog receives this vaccination and that is not overstating the obvious. Sadly, most pet owners are aware of this but choose vaccination because they feel they are at the mercy of boarding kennels, training schools and veterinarians. Patricia Monahan Jordan is a graduate of the North Carolina College of Veterinary Medicine. She practiced conventional veterinary medicine for twenty years and founded six different veterinary facilities in North Carolina. Dr. Jordan has traced the paths of immunopathology to vaccine administration and uncovered the cycle of disease and the endless cycle of disease management that results from vaccine administration. Dr. Jordan can be reached at http://www.dr-jordan.com.